Parade of Homes 2018 | Constructive Solutions, Inc. First-Ever Tiny Homes Featured in the Parade! With home prices in the Gallatin Valley escalating, Bozeman’s HRDC has continually worked to find affordable housing solutions within the community. Their latest project has taken an infill lot in an existing neighborhood and doubled the density, providing two new small, affordable homes. When asked to be a partner on the project, Constructive Solutions, Inc. was thrilled at the opportunity to be a part of the team, and design and construct these Humble Homes. 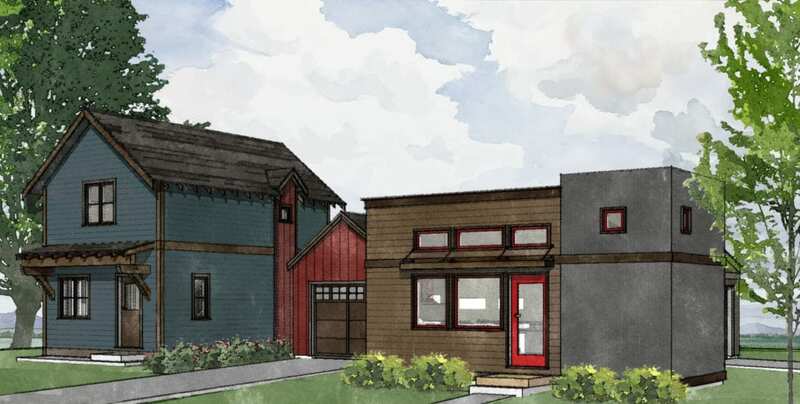 CSI was especially excited to market test the tiny home concept and show how they can be a sustainable and attractive option for affordable housing in new and existing neighborhoods. The larger “Loft” home consists of a 430 square feet footprint and 645 square feet of living space, while the “Tidbit” is a cozy 280 square feet footprint with small storage/sleeping loft. Each home has a single detached garage, a permanent foundation and an oversized crawl space access to accommodate easy-access storage. Utilizing extensive pre-fabrication at CSI’s shop, much of the construction happened off-site, which helped minimize disturbances to the neighbors and allowed for more efficient material use and quality control. Visit both homes during the SWMBIA Parade of Homes event this September! Parade of Homes is TWO WEEKENDS! For a list of Ticket Vendors, Visit the SWMBIA website.